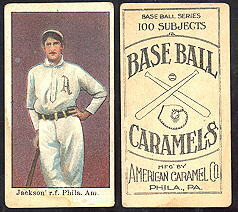 1909-1911 E90-1 American Caramel JOE JACKSON ROOKIE CARD! Issued with sticks of caramel candy. They are color reproductions of actual photos. 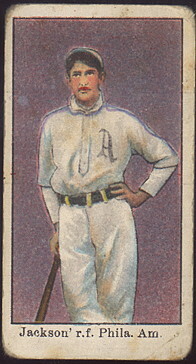 He was born 7-16-1887, died 12-5-51. played from 1908 through 1920 in 1330 games, plus 14 world series games. In 4,981 at bats he had 1,774 hits for a lifetime average of .356. 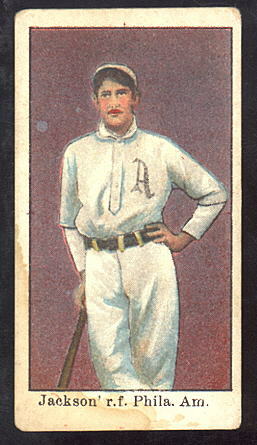 He was declared ineligible in 1920 for his alledged involvement in the 1919 world series scandal.